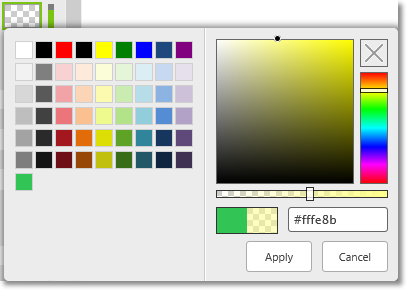 Color Select a color from Custom Color Palette or and opacity. 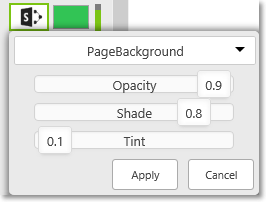 Select a color from SharePoint Color Theme and opacity, shade, and tint properties. Image Select an image from Computer, SharePoint or Web Address with repeat, position and size properties. Border Select Border Sides that should be displayed and specify a style (solid, double, inset, outset, dashed, dotted, groove, or ridge), width (in px, %, pt, or em) and color (from Custom palette or SharePoint theme). Radius Select Radius Corners that should be rounded. Margin Specify different margin (the space around elements) for different sides of an element using separate properties. Padding Specify different padding (the space between the element border and the element content) for different sides of an element using separate properties. Size Specify the width and height of an element. Size Set the size of a text with pixels, em, % or pt. 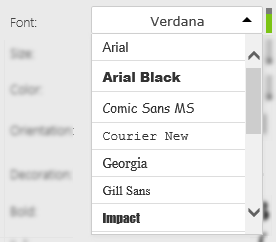 Color Select a font color using Custom Color Palette or from SharePoint Color Theme. Orientation Select the horizontal alignment of a text: to the left, centered, to the right or justified. Decoration Select text decoration: underline, overline or strikethrought.